Be the first to share your favorite memory, photo or story of Fredrick "Freddie". This memorial page is dedicated for family, friends and future generations to celebrate the life of their loved one. 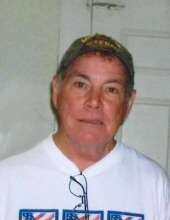 Mr. Fredrick "Freddie" Alan Land, age 71 of Boomer, passed away Saturday, March 30, 2019 at Forsyth Medical Center. Graveside services with Military Honors by Veterans of Foreign Wars Post 1142 will be held 3:00 PM, Tuesday April 2, 2019 at Little Rock Baptist Church Cemetery with Chaplain Larry Reavis officiating. The family will receive friends from 1:00 until 2:00 prior to the service at Reins Sturdivant Funeral Home. Mr. Land was born December 10, 1947 in Caldwell County to Fred and Beatrice Parsons Land. Mr. Land served in the United States Army during the Vietnam War. He was retired from YMCA Camp Harrison and enjoyed maintaining the grounds at VFW Post 1142. He is survived by a daughter; Tina Dotter and husband Mike of Boomer, a granddaughter; Krystal Dotter, a sister; Gail Land Hamby and husband Perry of Boomer, a brother; Richard Land and wife Loretta of Moravian Falls and several nephews, nieces and cousins. In lieu of flowers, memorials may be made to VFW Post 1142, PO Box 357, North Wilkesboro, NC 28659. To send flowers or a remembrance gift to the family of Fredrick "Freddie" Alan Land, please visit our Tribute Store. "Email Address" would like to share the life celebration of Fredrick "Freddie" Alan Land. Click on the "link" to go to share a favorite memory or leave a condolence message for the family.